Just when you believe you’ve seen everything it’s then the biggest surprises come along. With an extraordinary background and a series of innovations, roof top tent Overland represents the absolute evolution of its class. Identical to the everlasting model of Nino Cirani but with new appealing colours, this roof tent offers travelers the perfect style to suit all requirements for all adventures. History changes appearances to meet new trends and Overland distinguishes itself here too. Not only for it’s tried and tested, ingenious, functional and rigorously windproof design, but also for its brand identity which outclasses any others in customer appreciation and sales. As with the whole Autohome range, Overland typifies and perseveres ground breaking innovations, such as the exclusive Automatic Ladder Security System (ALSS) that allows for secure, stable use on any ground conditions, even on the most slippery of asphalt roads. The innovative design characterizes its fabrics as well (certified at 420 grams) and assures both excellent breathability and waterproofing qualities, particularly suitable for harsch outdoor use. Available in three colour combinations: Grey and Anthracite in the Carbon Model, Grey and Burgundy in the Bordeaux Model and Grey and Beige (Sand) in the Safari Model. Fabric: roof and sides are made of a heavy duty single-skin 420 g/m2, 50% cotton and 50% acrylic fabric, which is waterproof, breathable, rot-proof. Yarn: a widely used, high-tech yarn, made of two different fibres: pure cotton outside, a synthetic core inside. The AMANN® Trademark belongs to an international prestigious company manufacturing high quality yarns. Platform Boards: in layers consisting of a strong and elastic wood fibre having a 12 mm thickness; CHPL Silver Quartz veneering (0.3 mm). Waterproof and water-repellent layers that do not absorb humidity, they also neither warp nor rot. 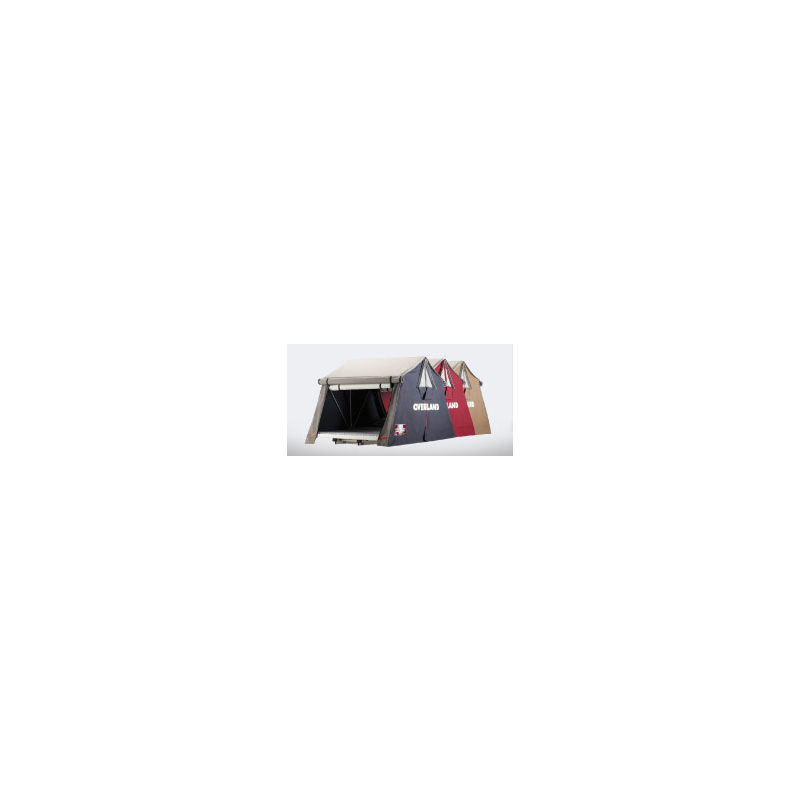 Metal components: combination of steel and aluminium to obtain a remarkably strong lightweight tent. Ladder: aluminium ladder with extension up to 2.30 metres. Mattress: made of foam rubber, density: 25 kg/m³, indeformable. 4 Universal clamps for attachment to roof bars, 2 windows and 2 large doors all with mosquito-netting, 1 mattress and 2-3-4 pillows, 4 awning support poles (hold open doors to create awnings) 1 PVC travel cover, 1 height adjustable alloy ladder, elastic straps assist in folding the fabric when closing. Standard: all models are configured for side (standard) opening. Optional: Explorer opening (Small and Medium models only) for opening over rear (or front) of vehicles. The travel over-cover can be quickly removed by the single elastic tensioner. The particular configuration always assures the maximum adherence also during the trip. The ladder is permanently connected to the base of the tent and allows to open quickly the tent with no effort. 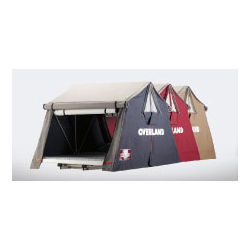 Overland is ready in a moment: your holiday can afford any comfort you would like to have.